LOUISVILLE, Ky. (Friday, April 29, 2016) – Churchill Downs Racetrack today launched a new mobile app to provide fans with convenient mobile access to the racetrack’s services and amenities including tickets, express ordering of food and beverages, maps and locations, Kentucky Derby horse and historical information and online wagering. 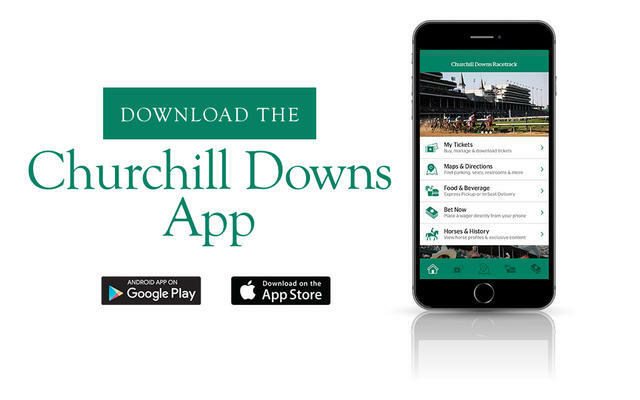 The app, powered by the VenueNext platform, is available now at iTunes at https://appsto.re/us/USS6bb.i and the Google Play Store at https://play.google.com/store/apps/details?id=com.venuenext.churchilldowns&hl=en. Fans will be able to use it at the track starting on Opening Night of the 2016 Spring Meet on April 30. The iOS version of the Churchill Downs Racetrack app is integrated with the Kentucky Derby’s betting partner Twinspires.com to allow fans to bet straight from their phone. The Android version allows fans to easily view our expert racing analyst’s picks for each race from their phone. Churchill Downs selected VenueNext to build the app because the VenueNext platform is able to seamlessly connect guests at sporting venues with everything a venue has to offer. The VenueNext platform is also used by Levi’s® Stadium, home of the NFL’s San Francisco 49ers and Super Bowl 50, Amway Center, home of the NBA’s Orlando Magic, Yankee Stadium, AT&T Stadium, home of the NFL’s Dallas Cowboys and U.S. Bank Stadium, home of the NFL’s Minnesota Vikings. Churchill Downs, the world’s most legendary racetrack, has conducted Thoroughbred racing and presented America’s greatest race, the Kentucky Derby, continuously since 1875. Located in Louisville, the flagship racetrack of Churchill Downs Incorporated (NASDAQ: CHDN) offers year-round simulcast wagering at the historic track. Churchill Downs will conduct the 142nd running of the Kentucky Derby Presented by Yum! Brands on May 7, 2016. The track’s 2016 Spring Meet is scheduled for April 30-July 2. The track has hosted the Breeders’ Cup World Championships eight times. www.churchilldowns.com. VenueNext is a technology company on a mission to transform the way people around the world experience venues. VenueNext’s platform unifies the venue infrastructure ecosystem giving venue owners access to an entirely new suite of sophisticated software tools and services that enhance business performance. VenueNext also develops context-aware smartphone apps that for the first time seamlessly connect guests with everything a venue has to offer. Founded in 2013, VenueNext is backed by Aurum Partners LLC and other funds affiliated with the owners of the San Francisco 49ers, Causeway Media Partners, Live Nation Entertainment, Twitter Ventures and Aruba Networks. VenueNext has offices in San Francisco, Silicon Valley and New York. VenueNext was named one of the top ten most innovative companies in sports by Fast Company in 2015 and the recipient of a 2015 Edison Award for Innovation. Please visit www.venuenext.com to learn more.